Ready To Look Better, Feel Better and Raise Your Fitness Level? The Juggernaut Athletics Xtreme ™ (JAX) training method developed by Master Trainer Jerome Givens delivers greater results in less time than any other workout! 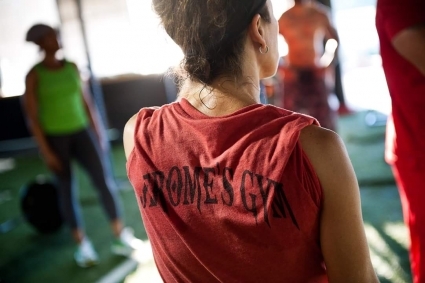 Whether your goal is to build muscle, decrease body fat run faster or just look and feel better in life, the trainers at Jerome’s Gym will help you reach your goals in the shortest amount of time possible. Our trainers will keep you focused and moving forward towards your ultimate goals. And our 30,000 square foot facility with state-of-the-art equipment helps ensure you have the variety you need to stay motivated and excited during your fitness sessions. During your free consultation we’ll identify your fitness goals. We’ll walk you through the facility, discuss any specific issues you may want to address, answer any questions you may have, and finally, design a program specifically tailored to help you reach your goals. Every single person who works out at Jerome’s Gym has a goal in sight, and a compelling story to tell about their journey. You’ll quickly discover our members are the best – and they help to provide the motivation and camaraderie we all need to stay on track. Ready? You’ll work with one of our professional trainers during your sessions, who will guide you in using the proper technique and form in an atmosphere that is competitive, intense, and most of all…FUN! You’ll meet fellow clients, make friends and get tons of encouragement along the way. Our training techniques are designed to get you the maximum result in the shortest amount of time. You’ll see your body transform and your strength and conditioning increase by leaps and bounds as you progress to your fitness goals. Are you ready – really ready? Then you’re ready for JAX – Home of the World’s Toughest Workout! We’ll train you and show you how to be in the best shape you’ve ever been in! We offer a choice of both Personal Training and Small Group training so you can decide which setting is best for you. Free Initial Consultation – Here’s how to get started – Give us a call at 972-664-0354 or stop by to set up your consultation. Our gym memberships do not have a sign-up fee, and are contract free!